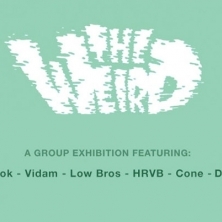 The Weird is a crew of artists spread all over Germany and Austria, founded in 2011. The ten members come from a graffiti background and focus on high quality character design in unique recognizable styles. They work as artists, graphic designers, illustrators and lecturers. Each one a serious heavyweight styler, they prefer a maverick illustrative way of designing, no matter if the (art)work is private or a commissioned.